Ah….a local show……and a good show day. How nice to have a short drive instead of hours on the road. The Abernethy grange is a small, older hall but the day turned sunny with enough light thru the windows to lift spirits and bring out the weekend shoppers. 1) Exploration of local breeders has revealed a lovely assortment of wool type & colors. I especially love the range of brown wool colors and am eager to use more of it. 2) I decided to concentrate on using local fleece for felting projects (rather than dyed for spinners. Plenty other vendors already provide a lovely variety of dyed & drum-carded batts, and besides, I lack a drum carder). So, I’m focused on wet-felting bags of grey & brown wool with added details; perhaps integrating white locks of wool or needle-felting locks atop the natural colored wool base. 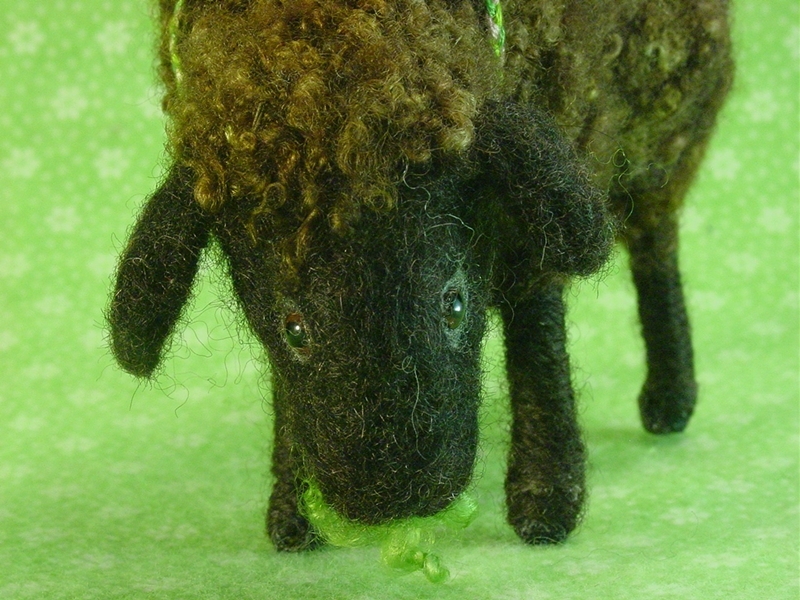 All sorts of ideas already being sketched in my notebook and ready to try out.. Needle-felted sheep figurines can also wear curly locks from area breeders. 3) I discovered it feels GOOD to promote Oregon wool breeders, especially since I already have a number of friends & fellow spinning guild members who raise these sheep. 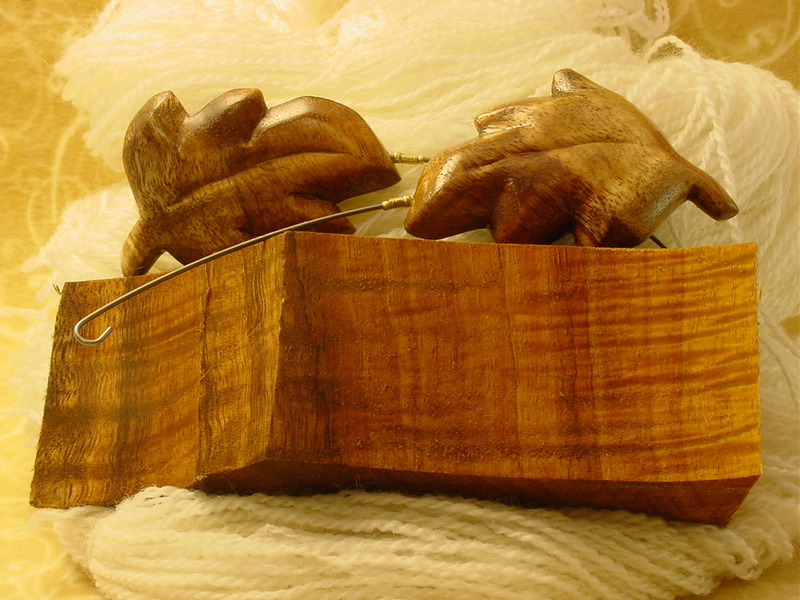 4) The realization that I also use a variety of local Oregon woods for my carved hooks (wood is a fiber too! ) Yes…I do have a smattering of so-called exotic woods from afar, but current count of Oregon woods numbers 16 & growing: Apple, Cherry, Driftwood, Fir, Hazelnut, Holly, Lilac, Manzanita, Maple, Madrone, Myrtle, Pear, Plum, Walnut, Willow, Yew. Hoorah for supporting the local economy! * Each show is a learning experience. Each new show brings the challenge of booth set up in the ever-changeable location or dimensions of the space allotted. Does one’s space have a wall? Is there a window in that wall to light the booth, or sun-blind the customers? It can swing either way. * What size space did I get….8×10, 10×10? And it makes a difference if the 8×10 space is 8’ deep front-to-back or 8’ wide side-to-side. Narrow width is a challenge for the customers you hope will crowd your booth. To acquire maneuvering room, I chose tall wire cube stacks on 1 side, instead of using tables on both sides, gaining more ‘standing space’ for the customer without sacrificing display capability. I am seriously contemplating utilizing grid walls in the future. What if you have a booth space with NO walls, because you are placed in the center of the room? You must decide whether to invent your own walls. Do you desire or need separation from neighboring booths? Sometimes yes, sometimes no. It depends. The neighbor booth can be lovely, but the combination of your products and their booth furnishings often creates visual clutter for either side, and a cloth barrier can offer a welcome solid backdrop for a display. Many times booths are outlined with lightweight fabric attached behind the display shelving. I happened to plan ahead, bringing a long swathe of semi-sheer fabric, which allowed a degree of privacy but still let light thru. It’s super lightweight and attractively pre-crinkled so wrinkles are never a problem. I’ve found that various size binder clips are best to secure fabric to the wire grids. Signs are another whole subject I contemplate for each show. I am temporarily using a foam-core poster board sign….while I slowly work on the 2 felted signs I hope to use long term. I love creating my own wooly sign! It’s a slow project but a labor of love. I incorporated gauze into the backing in hopes of lending strength, and a firmer hold for the grommets I’ll attach later. Each show is a new learning experience and ~ if one is observant ~ good ideas for a vendor booth can be found throughout any show and ~ tweaked to suit personal tastes ~ can be incorporated into one’s own booth set-up. We all of us learn from each other. It makes me so happy to discover how friendly other vendors are, and how willing to share tips and ideas. We all want each other to succeed so we can continue gathering together to have THIS MUCH FUN.